On Earth the road never ends. From tarmac to trail, beach to mountain pass, alleyway to distant highway, every ride is an escape into freedom. Go anywhere, go beyond, on the V-Strom 650XT. The V-Strom 650XT's styling reflects world-beating adventure-tourer performance. Its compact form creates a rugged, purposeful profile. Rider comfort is paramount and enhanced by the adjustable windscreen, by heat- and wind-diverting designs and by slim bodywork. Standard equipment; Spoked wheels, Knuckle guards, accessory bar and aluminium sump guard. All giving you and your V-Strom true adventure style and added protection, whether you're battling the elements or the terrain. A beak-like front cowl reflects Suzuki's spirit of adventure by evoking memories of the DR-Z ridden in the 1988 Paris-Dakar rally. A painted upper section contains dual multi-reflector headlights for great light distribution. While contrasting black plastic lower/side sections have a rugged surface texture and the front mudguard is shaped for smooth radiator airflow. The V-Strom 650XT's four-stroke, DOHC, 645cc 90-degree V-twin engine is ready for full range riding enjoyment. It offers the distinctive beat feel of a V-twin, ample torque for easy handling at low and mid-range revs, and powerful performance at the high end of the rev range. A broad power band makes for smooth going on steep mountain passes, open motorways, and crowded city streets. 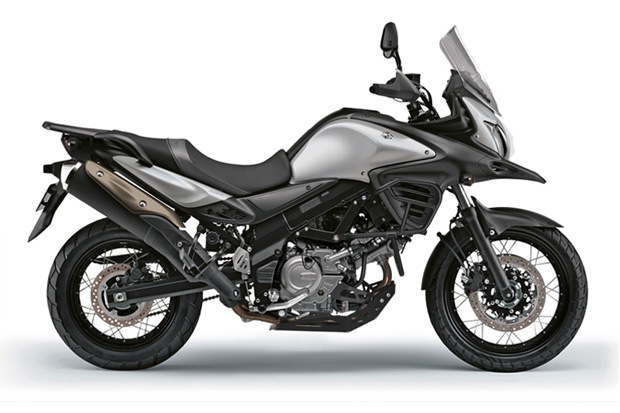 The V-Strom 650XT is built on a light, rigid aluminium twin-spar frame and swingarm with proven designs that ensure steady handling and great manoeuvrability. An upright riding position, long-stroke front and rear suspension, and lightweight wire-spoked aluminium rims also help to ensure comfort for adventure touring. The windscreen and compactly shaped bodywork reflect the results of extensive wind-tunnel testing in shapes that give great wind protection for low noise and low rider fatigue. The windscreen is three-way adjustable to suit the rider's stature, the riding position, and the road conditions. Minimised mechanical and frictional losses and optimised combustion efficiency help to keep fuel economy high, so a light, compact 20-litre fuel tank is ample for a class leading riding range between refuelling stops. Finance is available subject to status, indemnities may be required. Terms and conditions apply to residents of the UK and Channel Islands aged 18 years or older. Models available within these offers may vary, depending on stock levels and can be changed by Suzuki GB PLC without advance notice. Finance provided through Close Motor Finance Limited, Roman House, Roman Road, Doncaster DN4 5EZ. Terms and conditions apply to residents of the UK and Channel Islands aged 18 years or older. Finance is available subject to status, indemnities may be required. Finance provided through Close Motor Finance Limited, Roman House, Roman Road, Doncaster DN4 5EZ. All prices and specifications are correct at time of going to print.